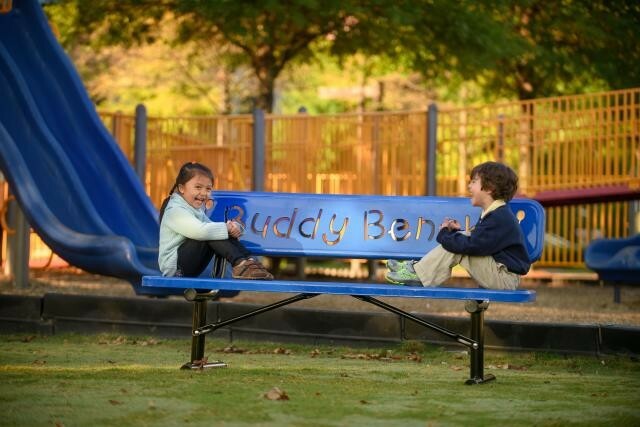 A buddy bench is now a standard requirement for all schools and playgrounds. The simple concept behind this bench has been adopted by educators around the world. Basically, when a student feels lonely, they know to go over and sit on the buddy bench. Other students in the play area are then instructed to mingle with that student. The Park Catalog offers buddy benches in an array of patterns and vibrant colors. Lengths are available in six or eight feet. These sturdy metal benches have expanded or perforated seats and backs so fluids won’t pool up and they are easy to clean. When it comes to dependable buddy benches that can withstand children and the weather, call the experts at The Park Catalog. We’ve been supplying school benches since 2001.